Education is often lauded as a means of empowering people. Colleges and universities are, in many ways, the loci of the “knowledge is power” ethos. But increasingly there is a movement to bring higher education to an underserved—and often invisible—population: incarcerated people. The United States has the highest prison population in the world, with the number of prisoners soaring in the decades since the mid-1970s. With just five percent of the world’s population, the U.S. incarcerates roughly a quarter of the world’s prisoners. “A generation ago there were loads of degree-granting college programs in U.S. prisons,” shares Joshua Dubler, assistant professor of religion. But in 1994, incarcerated people were made ineligible for the federal grants that funded these programs. This was a troubling development, especially in light of research showing education to effectively reduce recidivism and assist the formerly incarcerated with their social integration. Since the early 2000s, American universities have worked to address this issue. Cornell University, for example, has offered its Cornell Prison Education Program (CPEP) for nearly two decades. 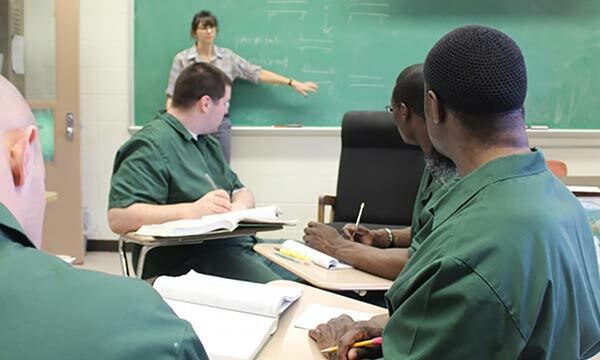 In fall 2015, the Andrew W. Mellon Foundation awarded CPEP a grant to expand its program and assemble a consortium of college-in-prison programs in upstate New York. Dubler has spearheaded the effort to involve Rochester in this partnership opportunity. “As institutions of higher education, we are in a unique position to contribute substantively to the effort to end mass incarceration in this country,” he explains. Beginning in the 2016–17 academic year, with funding from the Mellon Foundation and from Arts, Sciences and Engineering, Rochester will join forces with the Cornell Prison Education Program. In collaboration with the newly formed college-in-prison consortium, the University plans to offer four courses annually in area correctional facilities. In the fall, philosophy PhD candidate Jarod Sickler is slated to teach “Intro to World Religions” at Five Points Correctional Facility in Romulus, New York. The benefits of prison education work both ways as incarcerated people learn from the participating students and faculty, and vice versa. The result is education coupled with community building, an opportunity to bridge boundaries that might never be traversed otherwise. Dubler has seen these results firsthand. In addition to his research at the intersection of religion and mass incarceration, for years he taught at Pennsylvania’s Graterford Prison through Villanova University’s program. Last fall, with the support of the Rochester Center for Community Leadership, he taught a course titled “Theories of Religion” at the famed Auburn Correctional Facility in Auburn, New York, an hour’s drive from the city of Rochester. Three of his undergraduate students served as teaching assistants for the course, a version of which is also offered at Rochester through the Department of Religion and Classics. Over the course of a semester, they regularly attended class, held weekly at the facility. There they facilitated class discussions about the course material. Aaron Marans ’16, a religion major, went every week for the semester. For him, that consistency was a key part of building trust with the ten or so prisoners in the class, especially since “we didn’t share the same life experiences or discourse,” he explains. Although undergraduate students are not currently permitted at the Five Points facility, Dubler has seen creative workarounds. For example, an instructor could teach the course at the same time on campus and in the prison, and then have the two groups of students engage with one another’s work. Dubler is currently recruiting course proposals for the spring 2017 semester, and is eager to involve members of the University community in the project. To connect with him, email joshua.dubler@rochester.edu.